I know that some of you may just be cooking for for two this Thanksgiving and that many of you don’t celebrate Thanksgiving in your part of the world, so I wanted to leave you with a post that’s a great recipe for any time. I’ve heard a lot of discussion this year about cooking turkeys in pieces rather than roasting one whole (to save time and stress) so this would be a great way to cook the thighs. If you’re running around looking for last minute recipes or crafts to do before tomorrow, check out the Thanksgiving tab at the top of the page for some help. If you need some last minute decorating ideas, check out this post and if you just have a cooking question or need some tips you can always email me and I’ll do my best to respond! For those of you that are celebrating I wish you a blessed holiday, from my family to yours, and hope that you get to spend it with all of your loved ones! Preheat your oven to 350 degrees and heat 1 tbsp olive oil over medium-high heat in a dutch oven or other ovenproof pot. 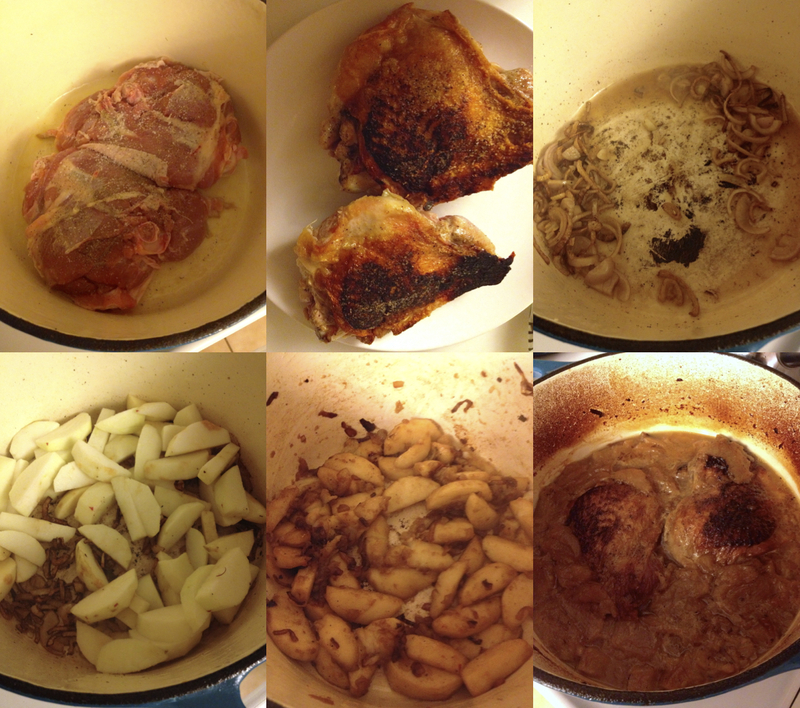 Pat 2 turkey thighs (about 2 lbs total) dry with a paper towel and season the skin side with salt and pepper. Add to the pot, skin side down, and season the other side with salt and pepper. Cook until the skin is golden and crisp, about 8 minutes, no peeking! This step is important because getting this great sear with give a fantastic crispiness on the skin and lock in a lot of flavor that would otherwise be lost if you just braised it. Transfer the turkey to a plate and add 2 large shallots that have been thinly sliced to the pot and cook for 5 minutes until softened. Add 4 granny smith apples (or cortland if you like a less tart flavor) that have been cored, peeled and quartered to the pot and cook about 5 minutes until slightly softened. Nestle the turkey back into the pot, skin side up and pour in 2 cups unsweetened apple cider and 1 can low sodium chicken broth. Bring to a boil, cover and transfer to the oven for 1 1/2 hours. Uncover and cook in over for 30 minutes more. Transfer the turkey to a cutting board and let rest. Skim the fat from the cooking liquid and stir in 2 tsp cider vinegar. 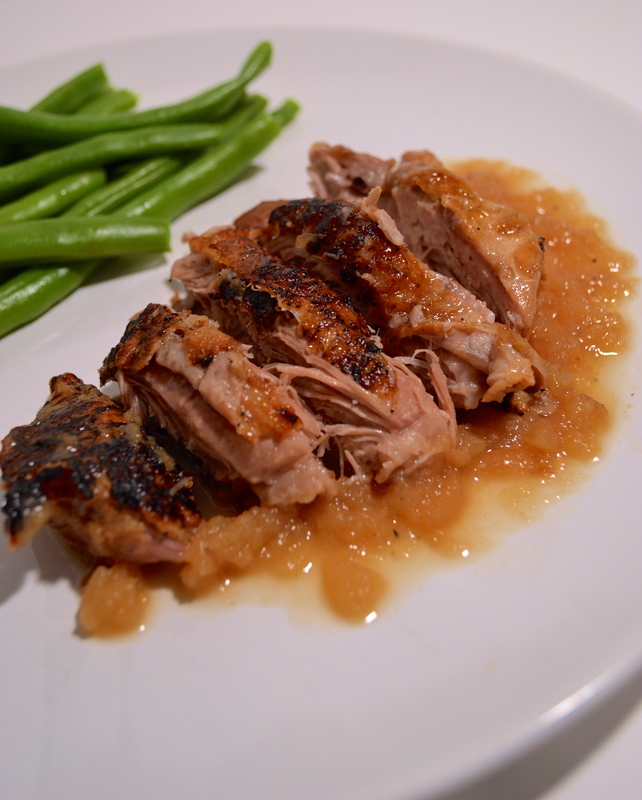 Slice the meat off the bones and discard, serve turkey with apples and pan sauce. I also steamed some green beans and served on the side. Reblogged this on The kitchen.